We take long-term partnership with our customers seriously and invest our excellent experience, profound knowledge and untiring dedication with a clear focus on optimal solutions for business processes within large organizations: This is our motivation for a joint research project with an autonomic group of excellent research scientists. ISIS Papyrus launched in cooperation with the Software Architecture Research Group of the Faculty of Computer Science University of Vienna the Adaptive Case Management research project CACAO. Christoph Ruhsam, project initiator and head of the ISIS Papyrus Academy, explains that CACAO focuses on solutions which include consistency checking of complex business processes and visualization of results. The ACM system supports business users with recommendations for best next actions in ad-hoc situations within the scope defined by the compliance rules. Project lead Uwe Zdun and head of the Software Architecture Research Group, explains that it is very important for scientific software engineering to apply mathematical ideas and algorithms short-term to real-life business situations to evaluate their relevance and effectiveness, which is only possible with joint industry research partners, both benefiting from the win-win situation. The project is funded by the Austrian Research Promotion Agency FFG and will last from 2014 until 2017. So what can you expect from this venture? Business processes, like any customer communication, are usually semi-structured or unstructured and thus, cannot be handled with classical procedural process design methods based on BPMN. Still, ad-hoc processes following a declarative approach have to adhere to company regulations as well as external compliance criteria. ACM is designed exactly for such situations in order to support business users with ad-hoc changes to predefined processes. It fully supports the creation and maintenance of new processes emerging from unforeseen situations. Or would you like to give your clients answers like, “Sorry we can’t help you – the system does not allow us to do this (or that)”? The Papyrus ACM solution takes customer experience to the next level! Business departments have the knowledge to find solutions to unexpected situations but how can they guarantee compliance and consistency in such dynamically evolving cases? 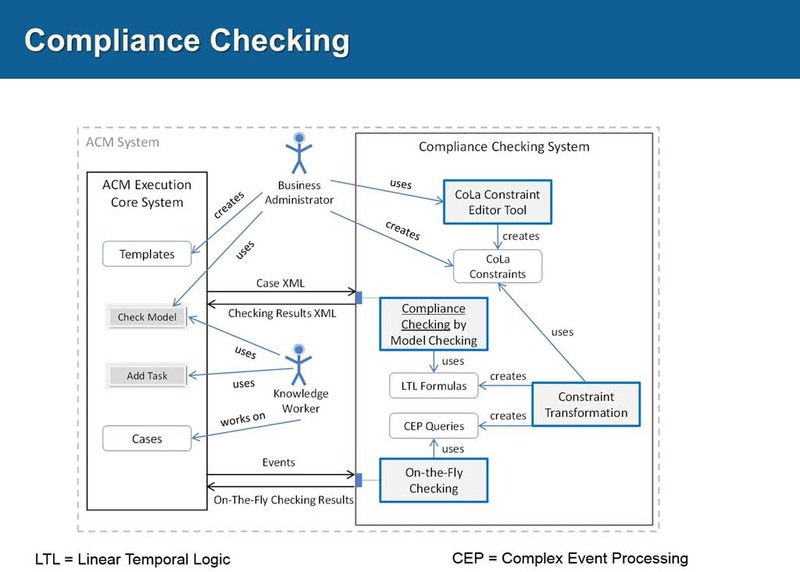 The way business processes are carried out will take a big step forward with ACM as checks for case consistency are made possible at any time during the process execution while users perform ad-hoc actions. A set of compliance rules defined in natural language (CoLa) by company management act as guardrails alerting users about potential violations so that they can freely decide about the appropriate next steps within their responsibilities. This way, company management keeps control and enforces compliance where needed and contributes directly to customer satisfaction. First results with a prototype combining Papyrus ACM with Complex Event Processing and Linear Temporal Logic algorithms are promising both for structural consistency checking including BPMN process fragments as well as compliance checking. 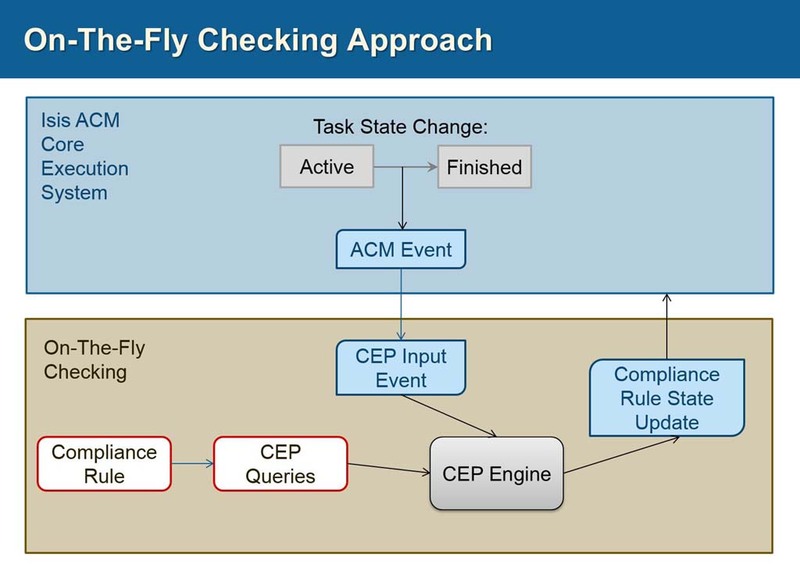 Checking happens at design time and on-the-fly during run time when users perform ad hoc changes. For more information, contact us or meet us at one of the coming ACM related scientific conferences! Check out more details about the Papyrus Adaptive Case Management Solution.